Lowering allows a rescuer to gain access to, or to extricate, an injured person. Patients are often lowered in a litter with an attendant, but subjects who are not seriously injured are sometimes lowered in a seated position. Lowering requires some type of descent control device (DCD) to create friction on the rope. The friction allows rescuers to control the descent with minimal effort. Descent control devices can range from tube-style belay devices and Münter hitches (for lighter loads), to brake bar racks and various multipurpose devices like the CMC MPD. Some rescue teams use single rope technique (SRT) for single-person loads—climbers use single rope technique exclusively. A single rope is more than adequate to maintain a good safety factor and single rope technique adds safety through simplicity (i.e., it requires half the rigging), but SRT does not pass the "critical point" (aka scissors) test. 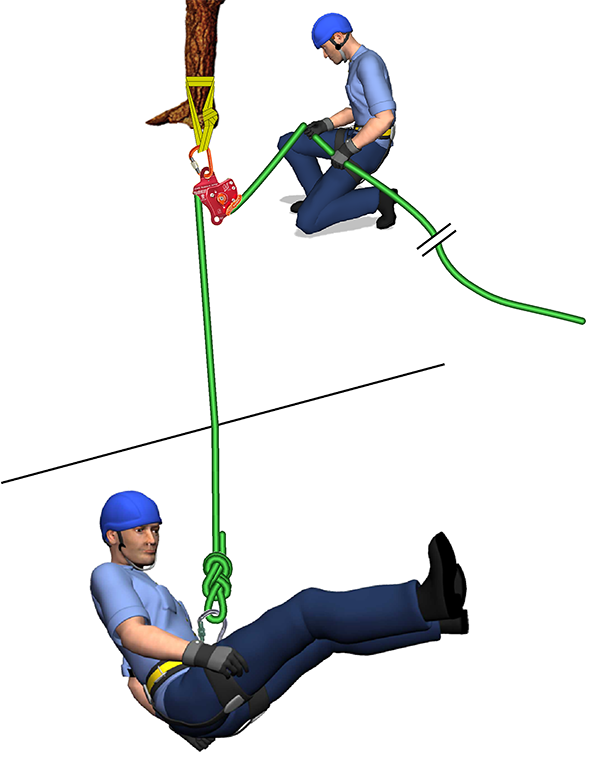 Double rope technique (DRT) is the most common method of supporting rescue loads (i.e., raising or lowering two people). 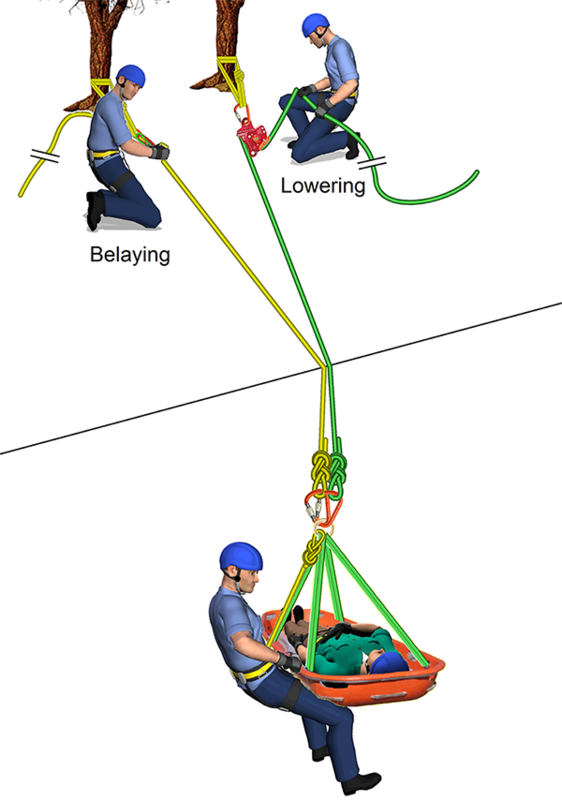 One rescuer normally controls the descent of the load and a second rescuer belays the load with the goal of catching it should the main line fail (an almost unheard of occurrence). The resulting two-rope system clearly passes both the "critical point test" and the "whistle test." The rescuer lowering the load uses a descent control device. The belayer uses tandem Prusiks or a device that is designed to catch a rescue load. It is important that the belayer minimizes slack in the belay line to avoid a shock load in the event the main line fails. 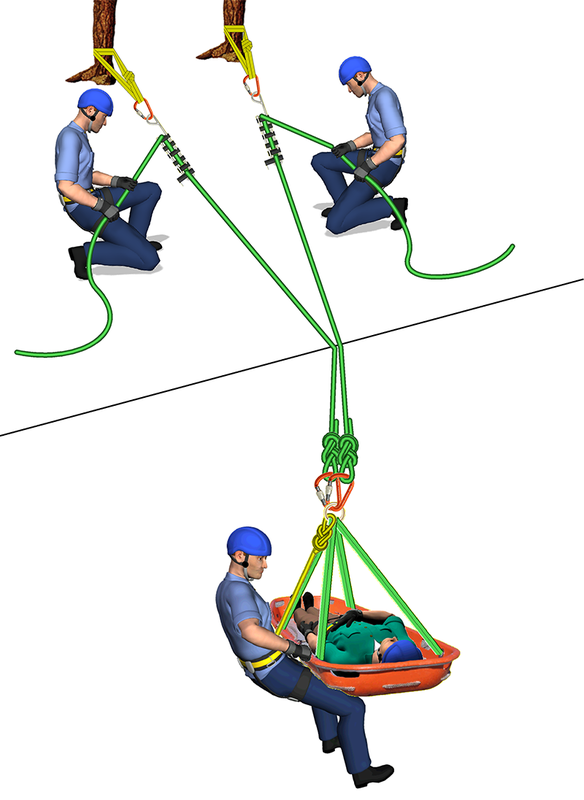 Note that some descent control devices (e.g., CMC's MPD) are designed to catch the load if the rescuer lets go of the rope. A mirrored DRT system has two main lines rather than a main and belay line. The advantage of a mirrored system is its simplicity—you don't need different skills or equipment for belaying. Mirrored systems also minimize slack so a failure of one line doesn't induce slack into the system. 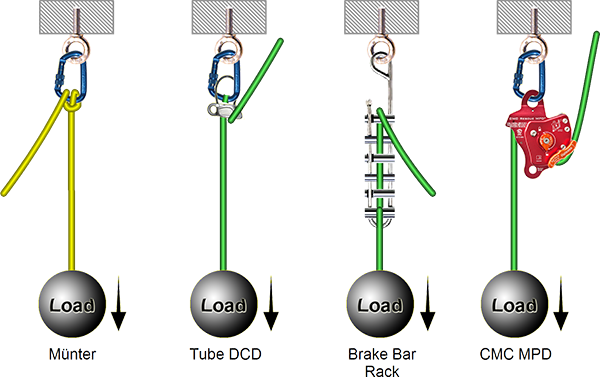 A key consideration of a mirrored system is ensuring that both lines are capable of holding the load if the other line fails.